With rising levels of global hunger putting the goal of ending malnutrition in all its forms by 2030 in serious jeopardy, the Food and Agriculture Organization of the United Nations (FAO) and the International Food Policy Research Institute (IFPRI) organised a global conference aimed at urgently accelerating efforts to achieve Zero Hunger worldwide. The conference highlighted how great strides have been made in many countries in reducing hunger and malnutrition, rapidly and sustainably, through improvements in public policies, focused investments and the harnessing of new technologies. Ethiopia transformed their food systems and diminished the threat of hunger through targeted investments in agricultural research and development (R and D) and social protection programmes. Starting in the mid-1980s and continuing over two decades, crop production in Brazil grew by 77 percent and that -- combined with the country’s Fome Zero programme, established in 2003 to provide beneficiaries a wide range of social services -- saw hunger and undernutrition nearly eradicated in just ten years. By convening key figures from the worlds of research, policymaking, and development programme implementation to share knowledge of the policies, interventions, and technologies that have effectively accelerated the elimination of undernutrition, the conference has catalyzed the next era of rapid reductions in hunger and malnutrition. 29 November 2018. The 2018 Global Nutrition Report shares insights into the current state of global nutrition, highlighting the unacceptably high burden of malnutrition in the world. 29 November 2018. The report “All Hands on Deck: Reducing Stunting through Multisectoral Efforts in Sub-Saharan Africa” lays the groundwork for more effective multisectoral action on reducing stunting by analyzing and generating empirical evidence useful for informing the joint targeting and, if necessary, the sequencing of sector-specific interventions in countries in SSA. Li, X. and Siddique, K.H.M. 2018. 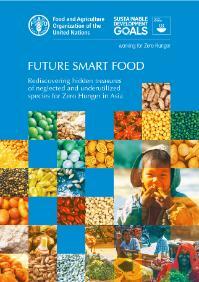 Future Smart Food - Rediscovering hidden treasures of neglected and underutilized species for Zero Hunger in Asia, Bangkok, 242 pp.